Note: Definitions or statements that are made below each broker/exchange are simply reiterations of what the brokers/exchanges has stated on their websites. The author is not explicitly or implicitly vouching for the validity of these claims or the efficacy of these trade platforms. By trading in the Swiss Forex Marketplace, the only one in Switzerland, clients benefit from the Swiss tradition of security and confidentiality and the country's stringent regulatory environment. Based in Switzerland, land of confidentiality, Dukascopy assign great importance to individual rights and therefore apply strict professional ethics. Dukascopy Bank SA is, like all banks and securities dealers in Switzerland, mandatory signatory of the “Swiss banks and securities dealers' agreement regarding deposits protection“. The custodian service, in cooperation with a number of Swiss Banks, allows clients to keep money in their banks while getting credit line to trade in the Swiss FX Marketplace. The custodian service consists of automatic daily settlement of P&L and trades in the client's bank account. Clients trade directly with Swiss Forex Bank & Marketplace from their personal Swiss Bank Accounts, without making funds transfer to Dukascopy Bank. All clients get the same price feed regardless of account size or trading strategy. Equal Trading Rights All clients have equal possibilities to provide and consume liquidity within the trading environment (marketplace business model). Transparent Historical Data Historical Data Transparency is an essential for strategy development and backtesting. Dukascopy provides high quality tick-by-tick quotes. This excludes any possibility for price manipulation by Dukascopy Bank. Transparent Liquidity The ECN model provides a clear view of the market through its unique market-depth window, showing available liquidity. Transparent choice of custodian Dukascopy Bank clients' can benefit from full and transparent choices of custodian-ship with numerous Swiss Banks which allows for flexibility regarding collateral deposit. View mode access to the account assures that all transactions and performances of the manager can be followed in real time. Additional protection is guaranteed by set up the acceptable risk level which works like a stop loss function and immediate account deactivation capability for the managed clients. Cross Language Transparency of Programming Automatic translation via built in convertor enables programming of the trading strategies based on multiple languages, such as JForex, MT4, MT5, etc. 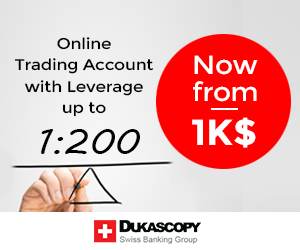 MT4 in Dukascopy Bank — leverage up to 1:100, deposit from $1'000 –Connect directly to SWFX Swiss Marketplace provided by Dukascopy with MT4 -No 3rd party bridges needed. Trade spot Forex, Metals, Binary Options, CFDs on commodities, indexes, stocks and cryptocurrencies through the same platforms. SWFX – Swiss FX Marketplace is a technological solution for trading, using a centralized-decentralized ECN – Marketplace model. The SWFX is specialized in institutional liquidity and instant execution. As one of the ten FX marketplaces in the world, Dukascopy — Swiss Forex Bank & Marketplace has a unique position because it combines liquidity of the biggest marketplaces and Banks. Market participants act on an equal and transparent basis. SWFX proposes to every client to act as a liquidity consumer and/or liquidity provider. The Swiss Forex Bank & Marketplace Trading Platform provides an array of tools for risk management and control over the order execution. Clients may trade billions of dollars in a secure (one-click) trading environment. Phone trading is also available via a 24/6 trading desk. Dukascopy Bank is able to instantly hedge client's trades with Forex participants in the network. It allows clients to trade high volume in instant automated mode. A few examples, Dukascopy trading platform allows to execute 100 million EUR/USD trade in One Click with effective spreads of 1.5-2.0 pips. When trading smaller amounts, one can obtain spreads as low as to 0.1-0.4 pips for majors. The general scheme above shows the main participants of the business model.The left side includes centralized and decentralized liquidity providers. 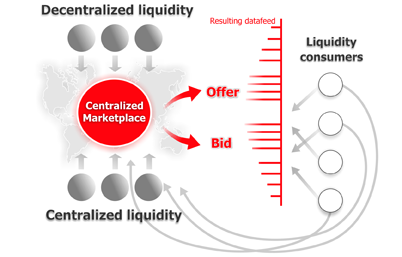 Combining their bid/offer orders in the resulting data feed, the central element is in fact the liquidity pool itself, being at the same time a centralized marketplace for its clients: liquidity consumers and centralized liquidity providers. Liquidity consumers are able to place bid/offer orders. EXECUTION Dukascopy Bank SA has a unique technology to hedge instantly any clients' trades directly with other Liquidity Providers. Dukascopy Bank is currently connected to Bank Of America, Commerzbank, Nomura, Barclays, Currenex, SEB, Deutsche Bank, JP Morgan, Societe Generale, UBS, Goldman Sachs, Citibank, BNP Paribas, HSBC Bank, HotstpotFXI, Lava – FX All Morgan Stanley and other liquidity providers. All trades are usually executed in milliseconds. LOW SPREADS Dukascopy Bank has integrated liquidity of the world's leading foreign exchange banks and ECNs. Because these numerous banks and service providers, Dukascopy Bank offers the deepest source of liquidity in the industry resulting in tight spreads. ECN LIQUIDITY The integration of the world's major banks allows Dukascopy Bank to execute large orders, which can instantly be hedged within the Liquidity Providers' network. For example, clients could trade in one click up to 200 million USD. MARKET DEPTH Dukascopy Bank gives the opportunity to all clients to access the market depth monitor. This tool provides the traders with information about the market structure for each currency pair. This data allows participants to anticipate the full execution before placing their order. LIQUIDITY PROVIDING Each client can place bids/offers in the market. The place bid/ask type orders allow users to act as liquidity providers by placing individual bids and offers right into the market. Bids/Offers are very similar to limit orders and are used to buy or sell a currency at a specified price or better. In addition to limit orders, Bids/Offers have several advantages. As all Bids/Offers are placed directly in the market, they can be taken by other liquidity consumers, thus allowing a trader to avoid a spread cost. Additionally, users can specify the time period (Good Till Canceled/Good For/Good Till) allowed for the system to process the order. All together, these features make Bids/Offers valuable tools for intraday trading. XM has clients from over 196 countries and staff speaking over 30 languages. Licensed and Regulated Broker XM Group is licensed by FCA in the United Kingdom (Trading Point of Financial Instruments UK Limited), ASIC in Australia (Trading Point of Financial Instruments Pty Limited), the IFSC in Belize (XM Global Limited) and by CySEC in Cyprus (Trading Point of Financial Instruments Ltd), adhering to enhanced regulatory standards. Focused on the Client Size does not matter. At XM the client comes first regardless of net capital worth, account type or size of investment. All clients receive the same quality services, the same execution, and the same level of support. XM was founded on these values, and that will not change. Wide Range of Trading Instruments Forex and CFDs on stock indices, commodities, stocks, metals and energies from the same trading account. All client funds are segregated in trust accounts with custodian banks including National Australia Bank (Australia) and Barclays (UK). Pepperstone focus heavily on a fast execution experience and low cost trading from as low as 0.0 on EURUSD.